Paralympic long jump champion Markus Rehm is set to compete against Olympic champion Greg Rutherford at next month’s Glasgow Indoor Grand Prix. Rehm bettered his own world T44 long jump record to 8.40m when winning his third successive title at the IPC Athletics World Championships in Doha last October. That mark is just one centimetre off the leap Rutherford recorded to win the IAAF world title in Beijing in August. “I’m very excited to compete at the Glasgow Indoor Grand Prix,” said Germany’s Rehm, who has competed against Rutherford once before, in Hengelo in 2014. “It will be my first time competing in Scotland and I’m looking forward to testing myself against some of the best long jumpers in the world. 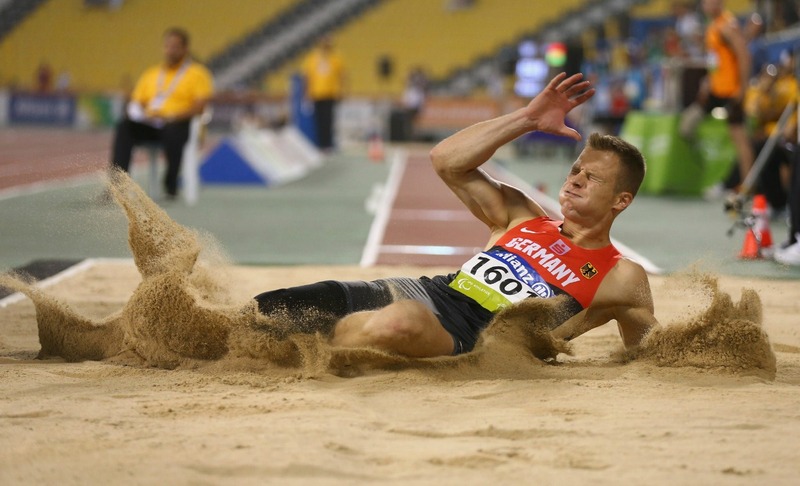 Last year, Rehm spoke with AW at the London Anniversary Games where the athlete explained how he had been denied a second national title despite recording the longest jump at the German Championships for the second year in a row. Other athletes so far confirmed for the Glasgow meeting, which will be the final event in the IAAF’s new World Indoor Tour, include Mo Farah and Jessica Ennis-Hill.